I qualified as a Solicitor in 2004 but worked in the legal profession for 6 years beforehand as a paralegal/trainee solicitor. 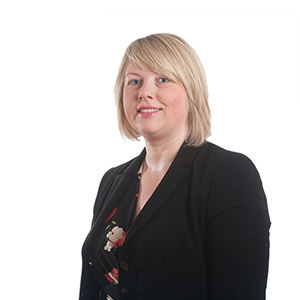 I re-joined the firm in 2011, having been previously employed by Birchall Blackburn as a paralegal in 1999. In 2015 I was appointed Partner. My specialisms include wills, probate, trusts, tax planning, Court of Protection and mental capacity issues. Qualifications and professional achievements: BA (Hons). I am a member of the Society of Trust and Estate Practitioners (STEP), Solicitors for the Elderly and the Law Society Private Client section. Personal Accreditations: Member of Society of Trust & Estate Practitioners (STEP), Solicitors for the Elderly (SFE), Full Professional Member. How did you end up working for a law firm? Having finished my English Language and Linguistics degree at Sheffield University I started temp work at my dad’s law firm. Following this experience I decided to pursue a career as a Solicitor. Unusual fact: I adopted a Staffordshire bull terrier from Bleakholt Animal Sanctuary after he’d been born blind and abandoned by his mother. Very happy with everything. All went well. Thanks for the home visit. The service was excellent and very helpful at all times. The service is efficient, staff very helpful land friendly. Legal representative extremely patient and helpful, offering expertise and ensuring that I was entirely satisfied. Excellent law firm – would recommend. You do everything well! Well pleased in all aspects. Lovely lady, made me feel comfortable. You are very informative and put me at ease. You have been my solicitors for 20 years or more. Just a short note to express our sincere thanks and appreciation for your guidance, help and support in bringing our case to a satisfactory conclusion. Please pass on our thanks to other members of your team. Thanks again for everything. Rosemary Johns was friendly, courteous and prompt at replying to email, even on weekends. She is a credit to your company. Everything you do is spot on. Very pleasant staff. I didn’t feel rushed in reception or with legal advice. I was very pleased in every way, but I can’t thank Rosemary enough. Big thanks to her. We’ve always been more than happy with the service you offer. Thank you. Most professional! Reception was first class!